If I wasn’t doing this I would: be a: professional poker player or arena announcer. Most impressive person I’ve ever met: My wife for being able to put up with me! I unwind by: a good sweat from a spinning class, a good night from a glass of whiskey, and some good tunes on in the background of whatever I’m doing. On my desk right now is: a world record’s amount of clutter. 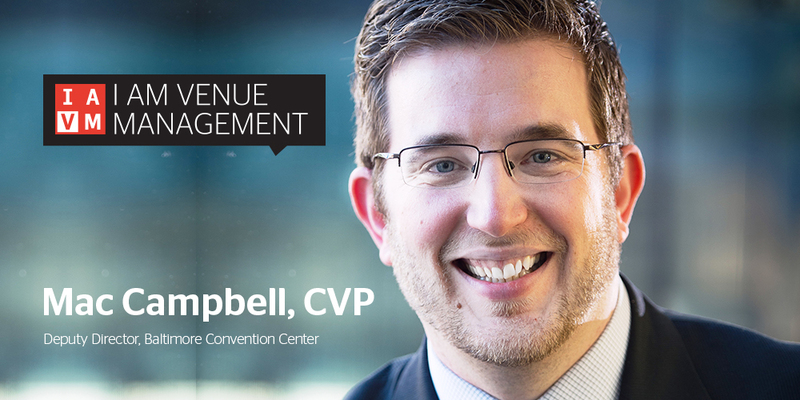 My favorite IAVM conference I ever attended was: Venue Management School/Graduate Institute. If I were on the other side of the seats, I would: be a left tackle (last played in high school!). One trait an up-and-coming venue manager should have is: sense enough to know when to ask questions. One up-and-coming venue star in the industry is: Jana Brooks from the Maryland Stadium Authority. One of my goals for this year is to: clean off my desk! How do you plan to help elevate the profession? By volunteering and spreading the gospel of proper planning, proper temperament in which to lead with, and encourage all to continue their education through IAVM. Where do you see new growth opportunities in the profession? Corporate Social Responsibility and Sustainability. Who are three people you’d invite to a dinner party and why? Frank Sinatra- Artistically a role model of mine. He’ll also make sure the party doesn’t end anytime soon. Dave Grohl – Because I really, REALLY don’t believe he’s that famous and still that down to earth. A Bulldog- Because what party isn’t better with a wrinkly pup?